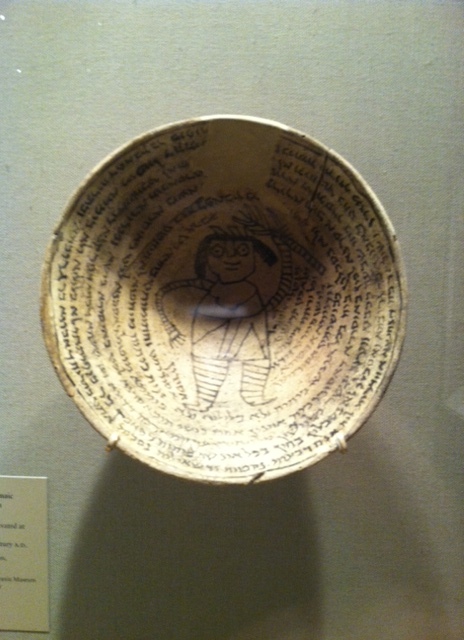 Relevance to the Bible: It was believed that the written words of the encircling prayer would be able to keep the evil forces in the center of the bowl at bay. Throughout ancient Israelite and Jewish history, authors used writing as a sort of sympathetic magic, a way to directly control and manipulate forces. The magical properties of writing meant that written words, once they came into being, were active and sometimes could be manipulated for both good and evil purposes. Numerous short dedicatory inscriptions found in Iron Age Israel and elsewhere made requests for divine blessing and protection, many having only the author’s name, the request, and the name of the deity. The inhabitants believed that the very act of writing down a prayer would manifest God’s presence into a sort of physical reality and thus allowed the words to become infused with visceral power. Written prayer could also be used to inflict pain and suffering. In the OT world, it was believed that the simple act of erasing a person’s name was tantamount to wiping out a person’s very life and essence. For instance, Hiram, a 10th century BC king of Byblos, wrote on his sarcophagus that anyone who attempted to destroy his inscription would have their own inscription (i.e., life) blotted out. In Psalm 69:28 the author writes about his enemies, ‘May they be blotted out of the book of life and not be listed with the righteous.’ Similar ideas about the transformative power of written words continued to persist among the Jewish populations of the ANE. 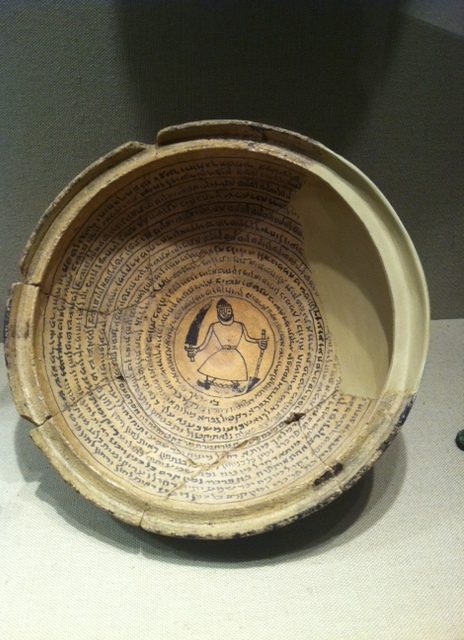 In late Babylonia (3rd-7th century AD), for example, countless ceramic bowls, like the two above, were inscribed with prayers, curses and healing rituals written in Jewish-Aramaic script encircling a bound demon or other evil spirits. Writing, even in this late period, was still invested with the power to bring prayers and curses to life. Thus, even by the 7th century AD, some followers of Yahweh continued to use incantation as a weapon against evil spirits. Indeed, Christianity in the Middle Ages was not monolithic and various groups held to different doctrines that shaped different religious practices. This is reminiscent of some forms of voodoo practice in West Africa. www.biblicalarchaelology.org/daily/biblical-artifacts/artifacts-and-the-bible/word-play/, Glenn J. Corbett, ‘Word Play: The power of the written word in ancient Israel’, 5/15/2014.